David, Gillian and Mitch. 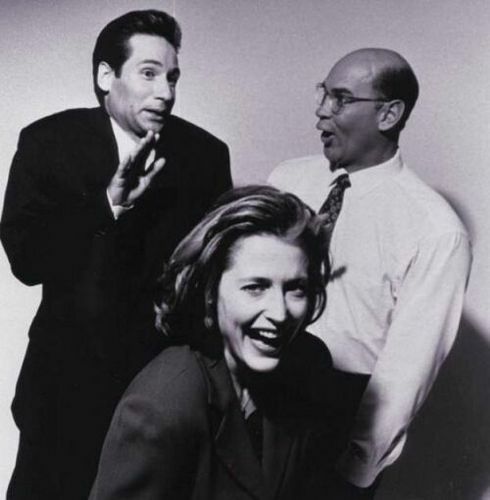 David Duchovny, Gillian Anderson and Mitch Pileggi goofing off.. Wallpaper and background images in the The X-Files club tagged: x-files scully the x-files mulder david duchovny gillian anderson mitch pileggi photoshoot. This The X-Files photo might contain портрет, выстрел в голову, близком расстоянии, макро, and крупным планом. Ha ha love this picture, so funny! Have you seen the one where Mulder is punching Skinner lol? It was from the same photoshoot as this. No! I don't think I have. How did I miss it! OMG, thanks so much! That is too funny. And I love how you gave me props for "picks" instead of "pics." LMFAO. I've never posted any XF Picks, but that works! LOL And I'm a comment whore, too.